Origin and Early Spread of Agriculture in the Old World (D. Zohary). 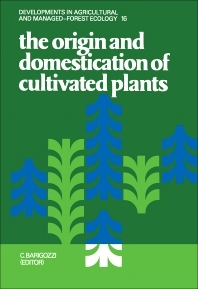 Plant Domestication: Diffuse Origins and Diffusion (J.R. Harlan). Archaeological Evidence of the Spread and Use of some Members of the Leguminosae Family (M. Hopf). The Use of Patterns in the Study of the Evolution of Allopolyploids (G. Kimber). The impact of farming on expansion of Human Populations (L.L. Cavalli-Sforza). Genetic and Evolutionary Aspects of Allopolyploidy in Wheat (M. Feldman, G. Galili, A.A. Levy). Gametophytic Selection as a Factor of Crop Plant Evolution (E. Otaviano, D.L. Mulcahy). The DNA of Crop Plants and their Wild Relatives (J. Brace). Evolution of Host-Parasite Balance in Natural Indigenous Populations of Wild Barley and Wild Oats in Israel (I. Wahl, A. Segal). Origin and evolution of wheats (E. Porceddu, D. Lefiandra). Pathways of Domestication with Regard to Crop Types (Grain Legumes, Vegetables) (P. Hanelt). Domestication of Fruit Trees (P. Spiegel-Roy). This book consists of the proceedings of a symposium organized by the Accademia Nazionale dei Lincei, Rome. The proceedings are unusual in that it is a rare event to see archaeologists and geneticists coming together to discuss the connection between historical facts and biological phenomena. The aim of the symposium was to discuss the origin of some important cultivated plants (wheat, maize, barley, oat, legumes and fruit trees) not only in relation to genetical mechanisms but also as a complex of historical facts recognizable through archaeological research. This international Meeting based on interdisciplinary concepts, met with a prompt and positive reaction from all those specialists invited to attend. The book itself is an unparalleled contribution to the interdisciplinary knowledge on the origin of crop plants and agriculture.